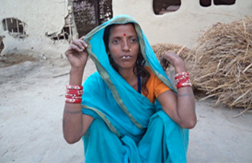 Dulari Yadava 50 year’s old woman Rajpur-3, Siraha had 6 months continuous coughing, with the evening rise of temperature and night sweating in the beginning one month. She also had severe chest and stomach pain. She lost more than 10 kg of body weight during her few weeks. She is a housewife and belongs to a poor family. She used to smoke bidi (a traditional cigarette like thing). She spent more than 4 hrs per day in non ventilated kitchen which producehuge amount of smoke from guitha (a traditional fuel made from dung of cow, buffalo, ox). Beside that she also helped her husband in farming, raring of animals they have domesticated like Buffalo, Ox. Farming was the main source of income of her family. Monthly income was even less than NRs. 5000 per month and owned only ten katha land.